Accordingly another amendment is in Rule 4(5). Inputs sent to job-worker directly should be received back by the assessee within 180 days otherwise he will have to make reversal of cenvat credit availed on inputs (no change). However, in case of capital goods, the period has been increased to two years. Time limit for availing the cenvat credit on inputs and input services under Rule 4(1) and 4(7) respectively has been increased to one year. Reversal of credit required to made under Rule 4 i.e. Rule 4(5) and 4(7), shall be made within 5 days after the end of month failing which provisions of Rule 14 (wrongly availing credit) will be attracted. In Rule 5, export goods have been defined i.e. any goods which are to be taken out of India to a place outside India. Under Rule 6, exempt goods include even non-excisable goods also. It means where an assessee uses common inputs and input services for dutiable and exempt goods as well as taxable and exempt services, if assessee avails full credit on all inputs and input services, he will have to pay duty @ 6% even on non-excisable goods. Provisions of Rule 9(4) applicable to FSD and SSD regarding maintenance of records are now applicable to registered importer also. Under Rule 12AAA, restrictions can be imposed on registered importer also due to misuse of provisions related to cenvat credit. 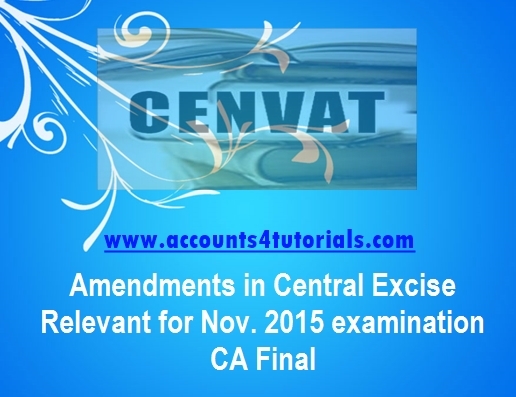 CENVAT credit wrongly taken will be recovered in accordance with the provisions of Section 11A of the Central Excise Act, 1944 and Section 73 of the Finance Act 1994.
credit inadmissible in terms of these rules taken during the month has been utilized thereafter. only when the credit is taken for the first time on an eligible document. Circular No. 999/6/2015 CX dated 28.02.2015 – For the purpose of exports of goods by the manufacturer exporter the place of removalwill be the port/ICD/CFS where the shipping bill is filed by the manufacturer exporter. However, if manufacturer supplies the goods to the merchant exporter then the place of removal shall be factory gate but on case to case, it may differ also. Provisions of Section 11 will be attracted in case of non-payment/short payment of duty for recovery of the amount of duty, interest and penalty. Under Rule 10 DSA can be maintained digitally provided every page is is also signed digitally. The CBEC is authorised to prescribe the conditions and procedure for maintaining records digitally. Rule 11 - When capital goods and inputs are sent directly to the job-worker as per the instructions of the manufacturer or service provider, the invoice issued by the vendor shall contain description of the manufacturer/service buyer and details of the job-worker as consignee. Similarly, if goods are directly sent to any person on the direction of the registered dealer, the invoice will also contain the details of the registered dealer as the buyer and the person as the consignee, and that person will take CENVAT credit on the basis of the registered dealer‘s invoice. If the goods imported under the cover of a bill of entry are sent directly to buyer‘s premises, the invoice issued by the importer should mention that goods are sent directly from the place or port of import to the buyer‘s premises [Fourth proviso]. Authentication of invoices by means of digital signatures has been provided by inserting new sub-rule (8) in rule 11. New sub-rule (8) provides that an invoice issued under this rule by a manufacturer may be authenticated by means of a digital signature. The Board may notify the conditions, safeguards and procedure to be followed by an assessee issuing digitally signed invoices. Rule 12CCC providing for restrictions that can be imposed by the Chief Commissioner are applicable to Registered importer also. Provisions of Rule 22 regarding furnishing of information of the records maintained and making the records available for inspection by the officers are applicable to registered importer also. Penalty provisions of Rule 25 are applicable to Registered importer also. Registration under Central Excise shall be granted within two days after submission of application. Verification of documents and premises may take place later on. Application for Advance Rulings can also be made by firms. Firm includes sole proprietorship, partnership, limited liability partnership as well as one person company.